Festive season is around the corner and the preparation for making sweets has started Namaste and welcome to my kitchen where anyone can cook! 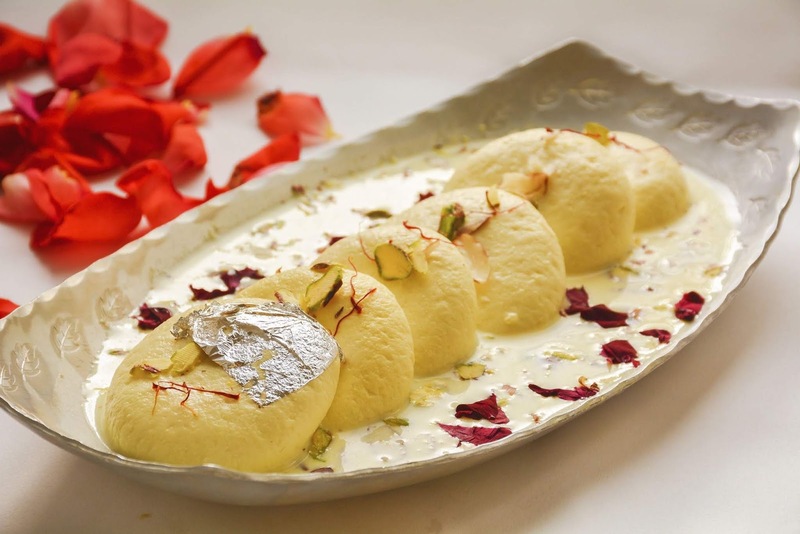 I'm making Ras Malai today Its a very popular Bengali Delicacy Soft, spongy, this dessert melts in your mouth we're making them step by step. First step being deriving Chenna from Milk and cooking that in a sugar syrup for the second step, we'll make the Rabri 3rd step is assembling, and serving it chilled lets make ras malai, lets get started! Step 1 : Make fresh paneer (chhena) using with 1kg cow milk for better paneer,take a big bowl and add milk and 2 tablespoons Lemon juice,After that take a clean and plane cloth or chessecloth and tie chhena on it.squeeze it very gently to remove excess water from it than hang it over the hook. Step 2 : After about 30 minutes,take out the chhena and knead it on the cleane surface or plate really well, for about 4 to 5 minutes till you get smooth dough or the fat of chhena release in your hand.it has too much moisture, rasmalai may break while cooking time.remove all excess water pressing with paper napkins. Step 3 : Now we'll roll them out and divide them into pieces to get 4 big balls, or 8 small balls now we'll roll these portions in our palms and make smoother balls out of them flatten it by pressing a bit if you think they have cracks then you can knead them again to smoothen them up. Step 5 : Open pan if you want but cover it. My chenna balls were ready in exactly about 7-8 minutes, if you cook them too much.. they'll get chewy/hard so its important to look out for over cooking after 7 minutes check it, its double in size perfect spongy and the net texture is perfect too. Step 1 : We'll let the milk boil first take out hot milk (2 tablespoons) to soak up the saffron strands separately we'll let it boil, keep the flame on low to medium heat. Step 2 : Add green cardamom powder,dry fruits,the saffron milk,Keora water condensed milk mix well. Stir well in every 2 minutes and scrape off the malai from the sides.Cook on a medium flame for 15 minutes till you have only 3.5 cups of mixture left in a small bowl. Step 3 : Add cornstarch, and 1/4th cup of cold milk,mix well and add it to the mixture thats cooking cook for 5 more minutes scrape off the malai after 5 minutes, switch off the flame, let the rabri come cool down in room temperature. Finally : Assembling Ras malai now add the chenna balls in the rabri one by one and keep in the refrigerator to cool step than serve it chilled with love and enjoy delicious home made Rasmalayi.